President Pranab Mukherjee signed an ordinance to amend Motor vehicle act 1988 as per Article 123 of constitution. It will allow e-rickshaws to move in hassle free manner in the city. In other words e-rickshaws are now included under the motor vehicle regulation act. Earlier e-rickshaws or battery operated three wheelers were banned over safety concerns. Transport Minister Nitin Gadkari had called on the President and explained to him the hardships faced by owners of battery-driven rickshaws. Transport Minister Nitin Gadkari had called on the President yesterday and had explained to him the hardships faced by owners of battery-driven rickshaws. Gadkari had told the President that only minor amendments were required in the Motor Vehicles Act to ensure licences for running the vehicles, official sources said, adding that the outcome has been positive. 1. Under the new act driving license is made mandatory for the driver. No person can be granted a learner’s licence to drive a transport vehicle unless he held the driving licence for light motor vehicle for a period of at least one year has been removed. 2. Maximum speed limit is fixed 25 kmph. 3. 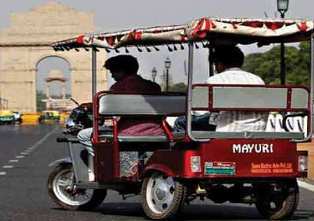 The e-rickshaws will be allowed to carry four passengers and 40 kg luggage. E-carts would transport goods upto 310 kg. The Bill was listed for debate in the business of Rajya Sabha on 22nd and 23rd December 2014 but could not be taken up for discussion. As the Parliament is not in session and looking at the benefit in public interest an amendment in the act was felt. It gives legislative power to President. He can issue ordinances when parliament is not in session in case of urgency law. The ordinance has similar effect to an act of parliament. However, every ordinance must be laid and approved by both houses of the parliament within 6 weeks from the reassembling. If not placed and approved by both houses of the parliament after reassembling it becomes invalid.